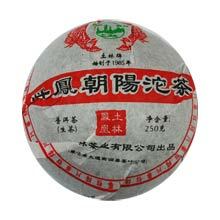 This unconventional 250 grams Tou Cha is made from Da Ye Zhong tea leaves from Nan Jian Wu Liang Mountain in Yunnan province. On the box is the Chinese words "Da Feng Chao Yang", which translate to "Rising Phoenix". This is the 25th Anniversary Special Edition tea. As soon as you open the box you will notice the exceptionally strong fragrance. A very good Tuo Cha that can only get better as it ages.